2008. Farrar, Straus & Giroux. Hardcover. 195 pages. Pearlie and her husband Holland live in the Sunset District of San Francisco with their young son. It’s the early 1950’s, and Pearlie and Holland still have baggage from the war and from the choices they each made during the war. When a man from Holland’s past named Buzz Drumer shows up at their doorstep, Pearlie will soon have to reexamine all that she thought she knew about her husband. 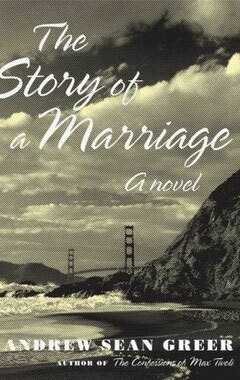 Domestic dramas about married couples do not generally stoke my interest, but my quest for San Francisco books available on my library’s bookshelves led me to give The Story of a Marriage a try. With its 1950’s setting, the book reminded me slightly of the good film Far From Heaven with Julianne Moore. The Story of a Marriage is told from Pearlie’s point of view in first-person – an older Pearlie, looking back on six months of her life in 1953. She’s a tricky narrator, concealing much from the reader at the beginning and then playing out the whole truth in bits. One revelation had me turning back pages to see the hints that I had missed, and to re-read passages that now had a new meaning to them. It never occurred to me that I could leave as well, not until a government man walked up to our house and asked for me by name. I tromped down in my faded sundress to find a very ruddy and clean-shaven man wearing a lapel pin of the Statue of Liberty in gold; I coveted it terribly. His name was Mr. Pinker. He was the kind of man you were supposed to obey. He talked to me about jobs in California, how industries wanted strong women like me. His words – they were rips in a curtain, revealing a vista to a world I had never imagined before: airplanes, California; it was like agreeing to travel to another planet. After I thanked the man, he said, “Well then, as thanks you can do a favor for me.” To my young mind, it seemed like nothing special at all. “Now that sounds like the first bright idea you ever had,” my father said when I mentioned leaving. I can’t find any memory in which he held my gaze as long as he did that day. I packed my bags and never saw Kentucky again. I liked Greer’s writing overall, such as the way that he worked in historical details such as Pearlie’s wartime job, lesser known aspects of World War II, and the Korean War, which is just lesser known, period. I also liked the descriptions of places: Pearlie’s home, a dance floor called the Rose Bowl, Buzz’s factory. I was surprised by how much I liked Greer’s depiction of Sonny, Pearlie and Holland’s little polio-stricken son. Pearlie’s relationship with Sonny is not the main focus of the book, but their interactions comprise some of my favorite scenes. A visit to the candy store comes to mind, and also just a totally-kid moment from Sonny when he complains at dinner that the pea on his plate is looking at him. Passages like that seem to be reaching for profundity, but sometimes sounded more like expanded versions of movie taglines. I did like some of the musings, but I thought The Story of a Marriage was better when it stuck to the story and to concrete details and images. I’m glad I read this novel. I thought the revelation of some of the secrets was masterfully done. I liked Pearlie as the main character most of the time, though I was disappointed by the last action she takes in the book, as I was greatly interested to see what would happen if she had chosen to do the opposite. I’m doubtful that the novel will stick much in my head after time has passed, but I might be wrong. Interesting fact: I heard in an audio interview of Greer that the book was inspired by something that actually happened to his grandmother, a story which she told the rest of the family late in her life. For more praise and hate, here’s my plug for Fyrefly’s Book Blogs Search Engine, which is where I always start to find book reviews. For photo credit, please click on the picture. 2008. Penguin Books. Paperback. 244 pages. This is the first book I’ve read by Michael Pollan, but certainly not the first time I’ve been exposed to his ideas. A number of years ago, I was visiting my friend Jocelyn in her apartment in Baltimore. On her kitchen wall, she had affixed a clipping of a news article about Pollan and one of his books (possibly The Omnivore’s Dilemma). I asked about the clipping and Jocelyn explained to me Pollan’s ideas as she knew them. Since then, I have run into Pollan’s ideas from reviews of his books, or radio interviews, or from word of mouth. So when I finally did read this book, In Defense of Food, I found myself running into ideas that were already familiar from these Pollan snippets. Additionally, I’ve read a good chunk of Jane Goodall’s Harvest for Hope: A Guide to Mindful Eating, which I found a little austere, but thought-provoking. Her book has some similar recommendations to Pollan’s. While the eating recommendations tread some ground familiar to me, Pollan’s discussion of ‘nutritionism’ was new to me. Certainly, I have long been skeptical of new health findings, as each new health claim is quickly supplanted by a newer one in quick succession. Still when Pollan illuminates the dubiousness of certain accepted principles of eating, I was surprised by how many of them I had assimilated anyway. One criticism of this book that I have is that Pollan challenges the validity of most food studies, but then uses other scientific studies to support his point, sometimes without telling the reader why we should trust them when he’s cast doubt on others. For instance, he uses a study run by the Organic Center for examples on how current food quality is compromised, but doesn’t address the fact that an institute “established by the organic food industry” might have an agenda too (p. 119). The take-away point that I would ideally like to enact, but might not be in the cards: “Try not to eat alone.” I often have the option of eating with my co-workers at lunchtime, but at dinner I’m frequently on my own and I usually take it to my computer desk, so I can multi-task. The picture I chose for this review reflects the kind of meal experience I’d like to have more often – eating a home-cooked meal with friends. 1931. Academy Chicago Publishers. Paperback. 388 pages. The fictional Diary of a Provincial Lady is as labeled: a diary of a married woman who lives in the country. She herself is unnamed, but her husband’s name is Robert and her children are Robin and Vicky. The diarist chronicles – in hilarious fashion – the little victories and failures that make up her days, whether it is dealing with the snobbish Lady B., managing servants, or going on a trip to France. The diary covers a period of one year. Arrive at station too early – as usual – and I fill in time by asking Robert if he will telegraph if anything happens to the children, as I could be back again in twenty-four hours. He only enquires in return whether I have my passport? Am perfectly aware that passport is in my small purple dressing-case, where I put it a week ago, and have looked at it two or three times a day ever since – last time just before leaving my room forty-five minutes ago. Am nevertheless mysteriously impelled to open hand-bag, take out key, unlock small purple dressing-case, and verify presence of passport all over again. I totally do that sort of thing before heading off on a trip! I love Delafield’s style of humor. I wouldn’t call it subtle exactly and definitely not difficult to understand, but she does approach it kind of sideways, slyly, with a formal vocabulary, so that the humor has a very slight delay to it. And then your brain is like “oh! yes, I get it!” and you laugh or smile, depending on the level of the funniness. It kind of prolongs the humor in a way. The wit is in the writing, for sure, and not so much what is actually happening, as what is happening could be described in a completely different tone and been an entirely different kind of book. As I was reading, I wondered if Helen Fielding’s Bridget Jones’ Diary drew on Diary of a Provincial Lady for inspiration. Although Bridget’s diary focuses on the life of the single woman and Delafield’s book focuses on a married woman, the narrators share some similarities: they are very open about their flaws, their egos, fantasies and inept attempts at various improvement projects. By the way, my copy is 388 pages but don’t let that fool you into thinking it’s a long book. The print is rather large in this edition and the reading just feels like it trips along at a good clip. 1920. Berkley Books. Paperback.198 pages. In a nutshell: This is the first book in Agatha Christie’s Hercule Poirot detective mystery series. The book is narrated by a Mr. Hastings, sent home from the Front on sick leave. Hastings is invited by an old friend, John Cavendish, to finish his leave at his family estate. The estate actually is owned by Cavendish’s recently remarried stepmother, Mrs. Inglethorp. It is she who is the murder victim in the mystery, with any number of suspects, as everyone seems to have at least one secret. This is the first Agatha Christie novel I have ever read, and I must thank my cousin Phil for getting me to read it. Phil has started a Book Group on Facebook, and every couple of months he and I, and assorted other relatives all read the same book. As far as mysteries are concerned, in recent years I’ve been most drawn to the police procedural type thriller, as opposed to old-fashioned detective mysteries. I don’t read a lot of mysteries on the whole though. I had never really had a desire to read Agatha Christie, under the (mistaken) assumption that I have been spoiled by her legacy. That is, I expected that more recent mysteries in print, film and TV, have employed every trick that Christie was using fresh in her own time. And so I suspected her mysteries would not seem fresh to me, because I would have seen it all before in derivative form. Well, I’m pleased to say I was wrong. Christie makes sure to make almost every character in the book look a little suspicious. I was pretty sure that this book was not the one where Christie made the narrator the murderer (I think that one is a standalone and I’m glad I don’t remember its title.) As my suspicions roved around the cast of characters, I was on the right path at one point. But then, even a broken clock is right two times in a day. I liked that the everyman Hastings was the narrator. He is blind to his own faults as most people are, which makes it kind of funny to observe his easily hurt pride and blunders. But he’s overall a likable chap. And he is a great perspective from which to watch Poirot work. Brilliant detectives can be fun to read about, but I think it would be hard to make them good first-person narrators. I like having a little distance in the perspective. I think I’ll probably read more Christie mysteries in the future. The Mysterious Affair at Styles was a quick, pleasant read, good for interspersing among longer, heavier books. Poor Emily was never murdered until he came along.